You will need to register and be logged-on. 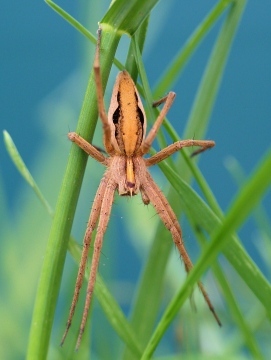 The Nursery Web Spider is a common lowland species south of a line from north Yorkshire to the southern Lake District although there are scattered records throughout Scotland as well. It is an active hunter that usually frequents herbaceous vegetation including uncut grassland, nettle beds and heaths. Adults (females 12-15mm, males 10-13mm body length) generally mature in early to mid summer but the species is easily recognised even in the early immature stages. The body is characteristically cigar-shaped and the legs are relatively long and robust. When resting, the front pairs of legs are typically held rigidly outstretched and very close together. The body is very variable in colour, from grey, through yellowish orange to dark brown, and bears patterning that may be very distinct or almost absent. The carapace almost always has a darker median band with a narrow white or yellow line down its centre while the abdomen may have pale lateral bands with wavy edges. Sometimes the abdomen is marked like the carapace, with a light median band running down the centre of a broader dark band, again with a wavy edge. In the UK, the Nursery Web Spider is most likely to be confused with closely related raft spiders (Dolomedes fimbriatus and D. plantarius). 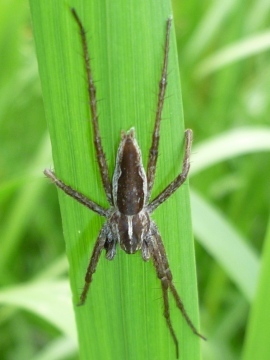 The raft spiders have a similar shape and leg posture but are rare species, substantially larger as adults (females 13-23mm, males 9-16mm), and restricted to wetland habitats. Most have cream or white lateral bands on a brown or black background on both the carapace and abdomen; these are more prominent than the pale lateral bands sometimes seen on the abdomen of some Nursery Web Spiders. Nursery Web Spiders are at their most conspicuous and distinctive during the breeding season. Their silk egg sac is white or beige and is carried under the body, held firmly in the mouthparts (not at the end of the body, attached to the spinners, as in the wolf spiders (Lycosidae)). 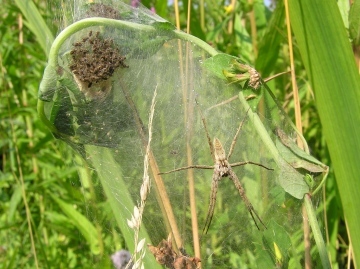 Before the spiderlings hatch, the mother constructs her conspicuous nursery - a dense silk tent – in which she can initially be seen holding her egg sac. Once the spiderlings hatch she can usually be seen on guard on the outside of the tent while the cluster of spiderlings, together with the torn, whitish remains of the sac can be seen inside. The nurseries are built in robust, usually herbaceous vegetation, sometimes at quite high density. Their numbers peak from mid-June to July, with a smaller, later peak from mid-August to September. 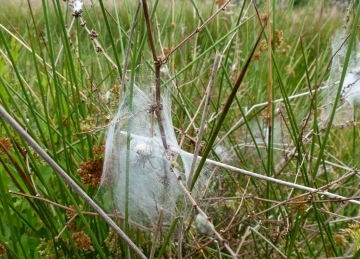 Silk tents with a more open structure, found in similar vegetation in May or early June, and containing spiderlings with distinctive, round, yellow abdomens marked with a dark, backward pointing triangle, belong to orb web araneid spiders. In contrast to the webs of the Nursery Web and the raft spiders, these webs are not constructed by the mother but by the spiderlings themselves.